From the family, Hyacinthaceae, having common name(s) associated with the genus; Pineapple Lily. 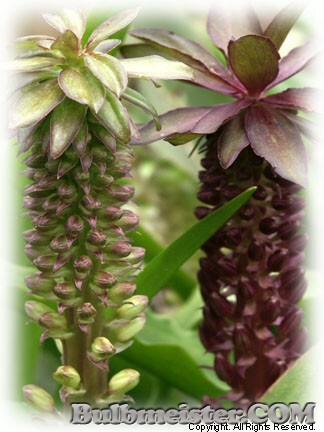 (Eucomis punctata) Flowers greenish-white in a long raceme, with purple-brown on edges of petals. Ovary purple. Leaves lanceolate, glossy, 2-3 inches wide and 24 inches long, channelled, spotted reddish-brown underneath. Scape spotted purple. Ht. 24-28 inches. Hardy in zones (6), 7, 8, 9, 10. Price Reduced, down from $12.95, 06/14/2017!